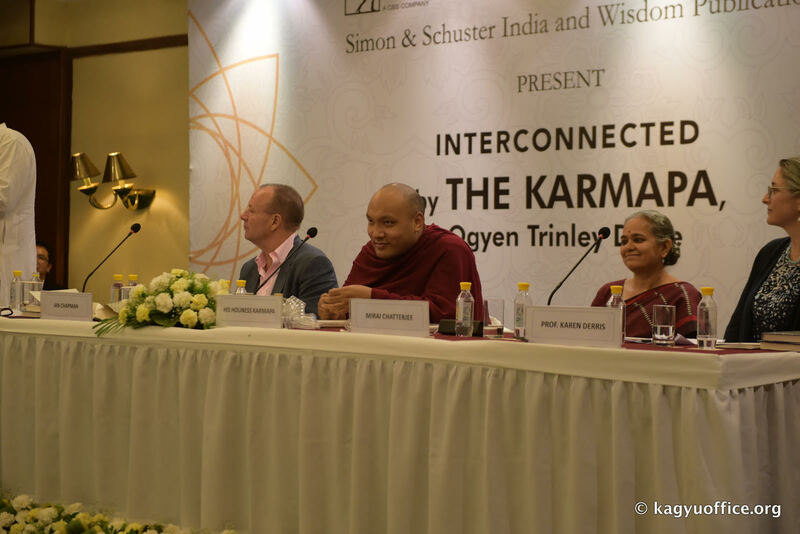 New Delhi, 22 April, 2017 – His Holiness the 17th Karmapa, Ogyen Trinley Dorje’s new book, Interconnected: Embracing Life in Our Global Society, was released today in India at a special event at the Habitat Centre in Delhi, by Simon and Schuster India/Wisdom Publications. In this book, the Karmapa outlines his vision for a global society that truly reflects the interdependence that is now becoming widely recognized, and shows a way forward to enacting that vision. 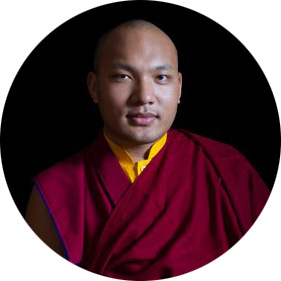 The Karmapa is an influential voice in the new generation of thought leaders and spiritual head of one of the major schools of Tibetan Buddhism, which has been working with the notion of interdependence for many centuries. Despite polarizing forces that would seek to erect barriers and deny our connectedness, global economic integration and information technology are making our interdependence increasingly direct and undeniable. Within this historical moment, the Karmapa argues that we must not retreat behind walls but join together in collective action to build a global society that acknowledges and draws on our fundamental connectedness. In Interconnected, the Karmapa argues that the crucial next step is to move beyond theoretical understanding of our interconnectedness, to begin to actually feel connected in our hearts. He shows how our inherent capacity for empathy can be strengthened to serve as a sound natural basis on which to develop the personal and social values that are consistent with living as interdependent individuals: compassion, responsibility, equality, and valuing of diversity. “The information age makes us highly aware of our interconnectedness and the Internet allows us to see how much we depend on one another. But we also need to have an Innernet – not just a connection on a material or outer level. 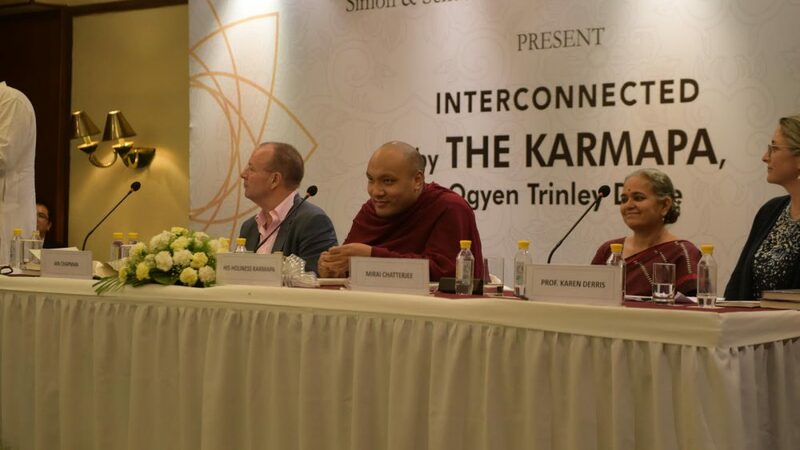 We need to be able to feel our connectedness inwardly,” the Karmapa said, speaking at the book launch. The book is a result of a month-long dialogue between the Karmapa and a group of students from the University of Redlands, California who traveled from the USA to Dharamsala to learn from him. Reflecting his deep commitment to open exchange across boundaries of culture, education, race, and economic status, the Karmapa holds annual dialogues with youth from around the world. His latest interactions took place with postgraduate students from Ambedkar University Delhi’s psychology department, to explore Buddhist and modern psychology’s approaches to working with emotions. The 17th Gyalwang Karmapa, Ogyen Trinley Dorje, is the spiritual head of one of the major schools of Tibetan Buddhism. The Karmapa has been dubbed the “new face of Tibetan Buddhism,” and many Tibetans look to the Karmapa for inspiration in their struggle to preserve their embattled culture. He has emerged as an international Buddhist leader and environmental activist, founding Khoryug, a region-wide eco-monastic movement. He currently resides at Gyuto Monastery near Dharamsala, India.